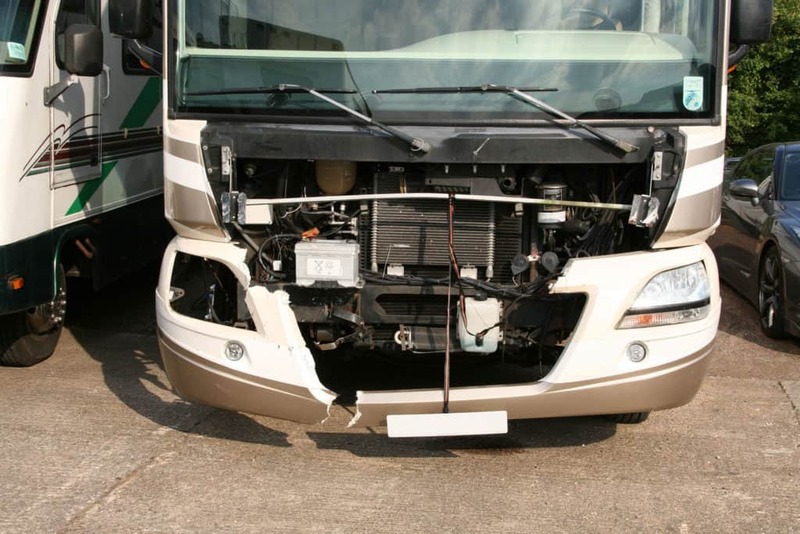 If you have an accident in your RV Motorhome, what happens next? 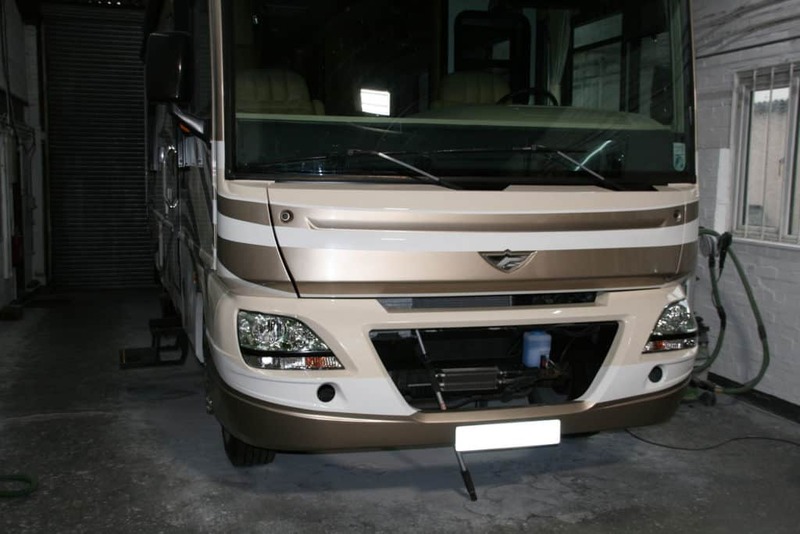 Before you start a massive debate with the Insurance company, you need to find a reliable Accident Repair Centre whom you can trust to carry out the repairs on your RV Motorhome. The first thing to do is to notify your Insurance company to which they may request several estimates. At this point, you need to know that if you want to, you can choose your own repairer. 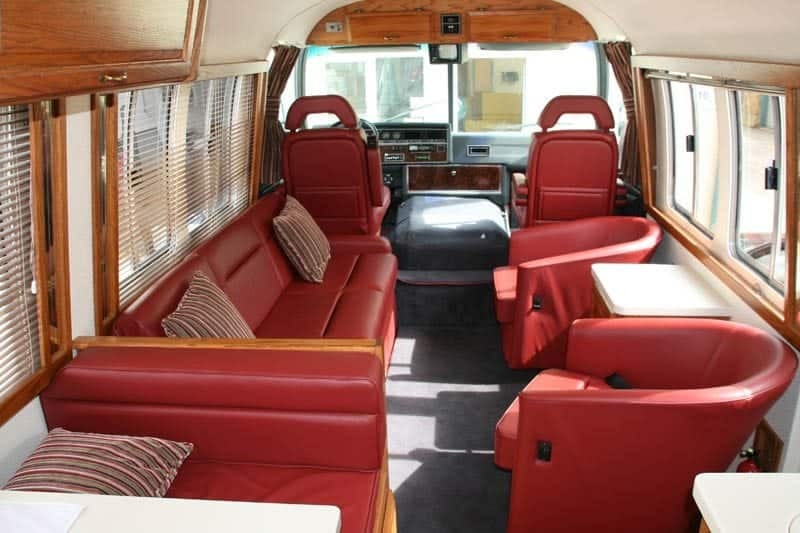 This is due to the fact that an American RV Motorhome is a specialised vehicle. The other thing to take into consideration is that if you start driving all over the country to get quotes, how much fuel are you going to use? 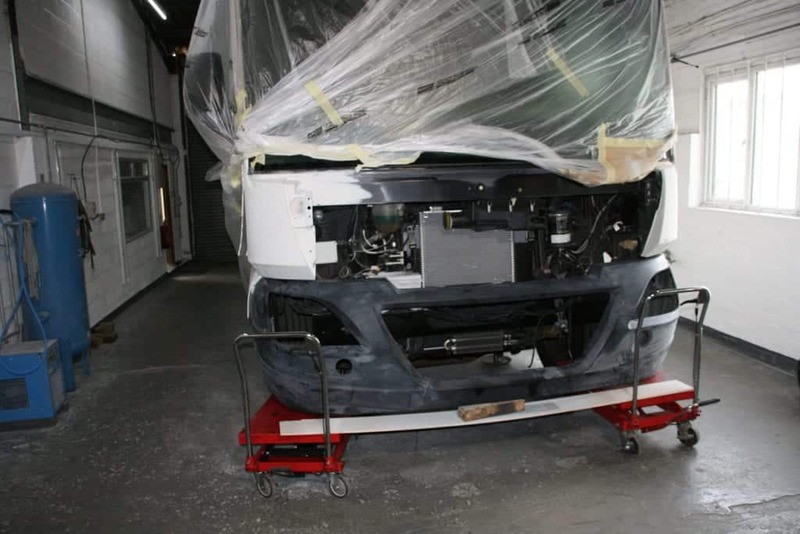 First of all, due to the problem the RV manufacturers have had with insolvency over the past few years, a lot of the body parts are no longer available. 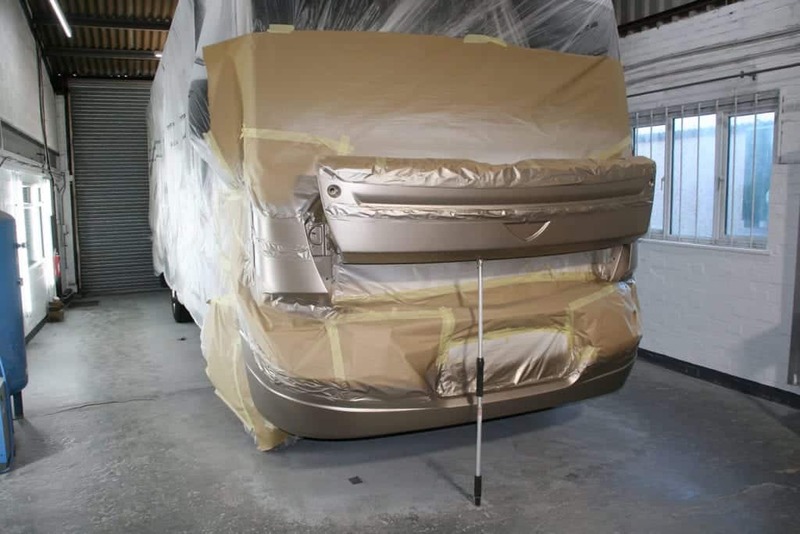 The commercial or bus body shop will give you an estimate for the work, the insurance company then accepts it and you think you are home and dry. 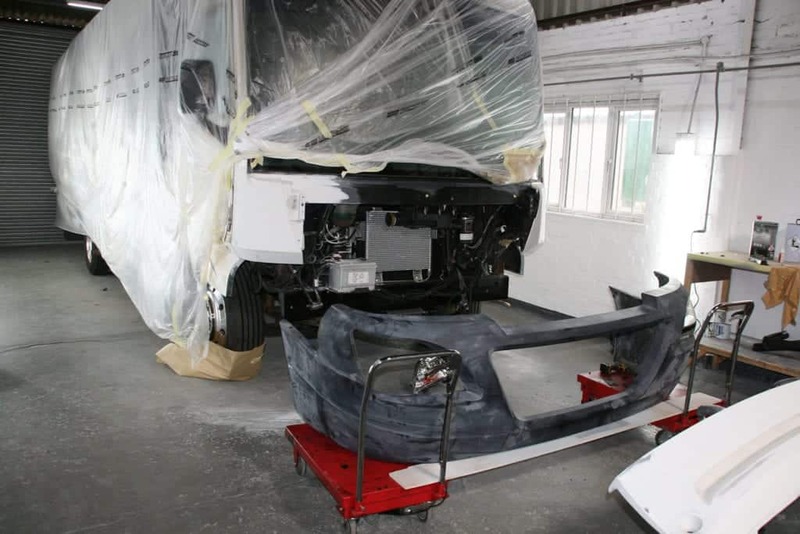 What happens, in reality, is, that the commercial or bus body shop orders the parts they need, only to find that they cannot get them or alternatively they have to wait forever for them. 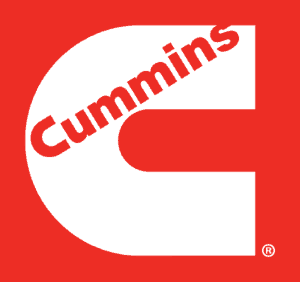 At LAS motorhomes if we cannot buy the parts that are needed, then we will make them. An example being locker doors on some models that are not available, so we have made them. 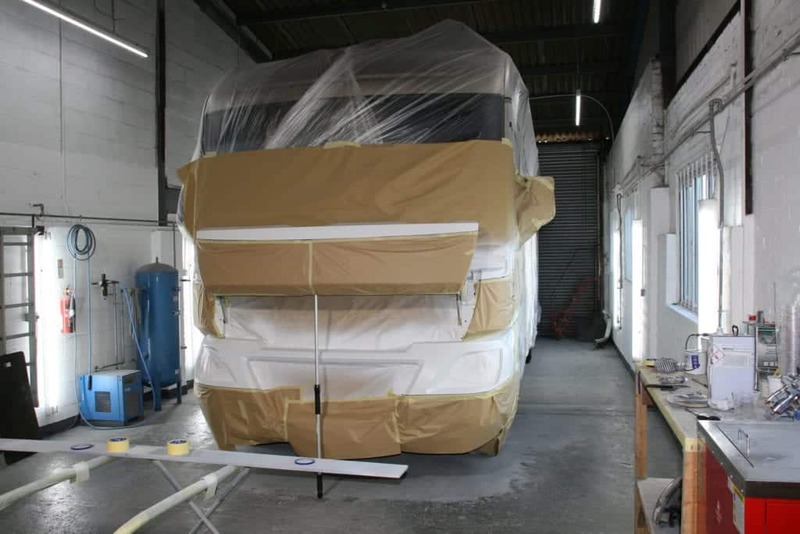 If you need part of a side for your RV motorhome, for instance, LAS motorhomes have the skills to make it for you. All in all, its all about knowing your craft, and part of that is knowing what you can buy and what you can’t and then having the equipment to be able to make what you cannot buy. 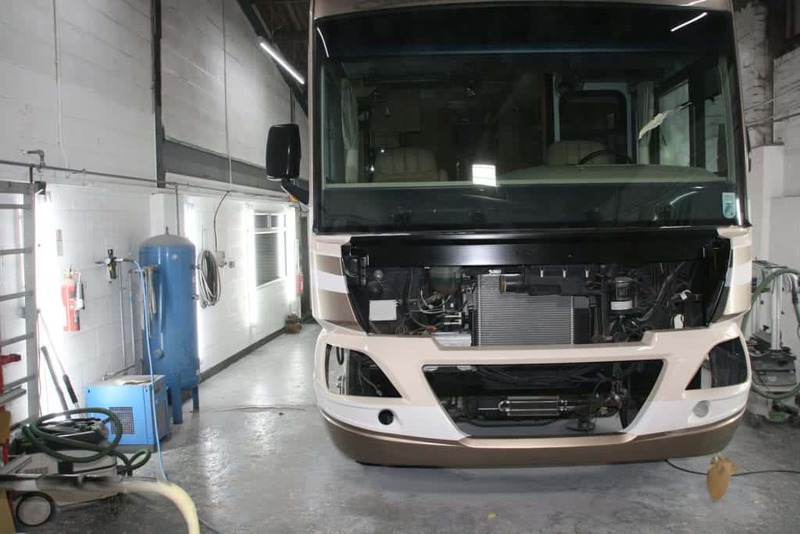 The other thing is can you trust the repairer with your motorhome? When it comes to damage decals there is definitely no use in ordering them, you have to paint them on. American vinyl colours are not the same as European. As mentioned earlier many American RV companies have changed ownership or gone into insolvency. 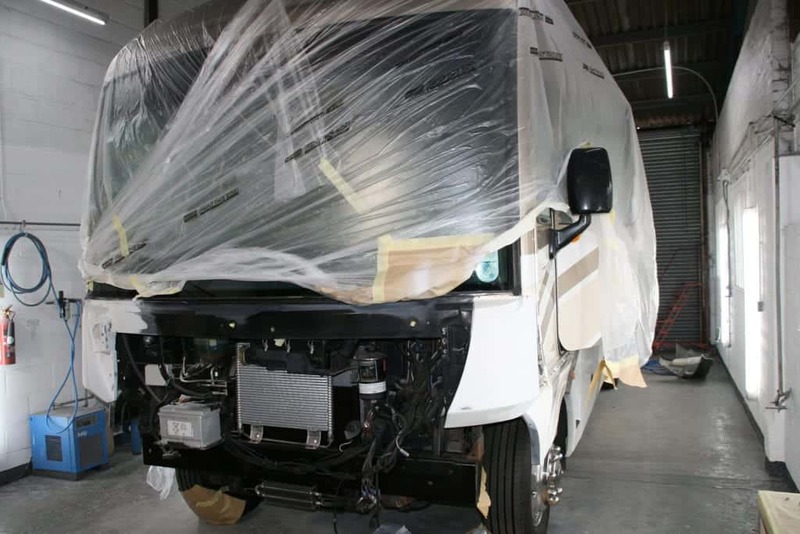 The companies that have changed ownership now only want to sell you a new motorhome. 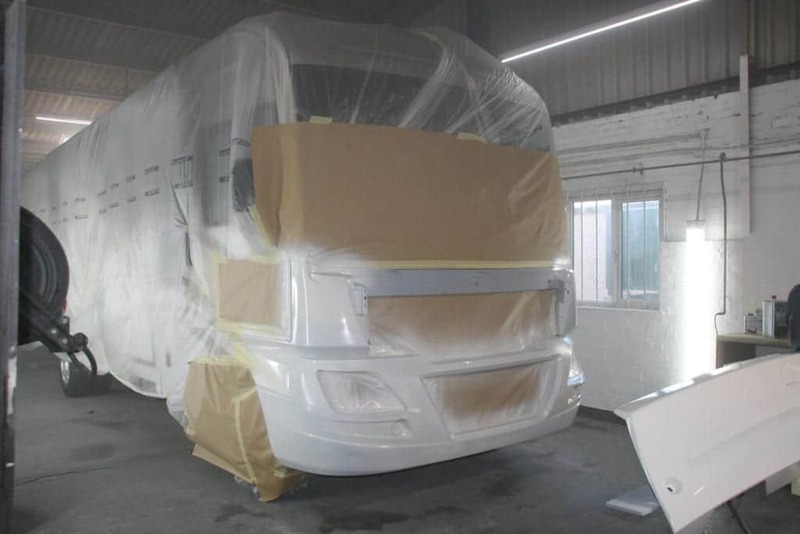 Here at LAS Motorhomes, if you deliver your vehicle to our workshops with your Insurance details, we will sort it all out for you. 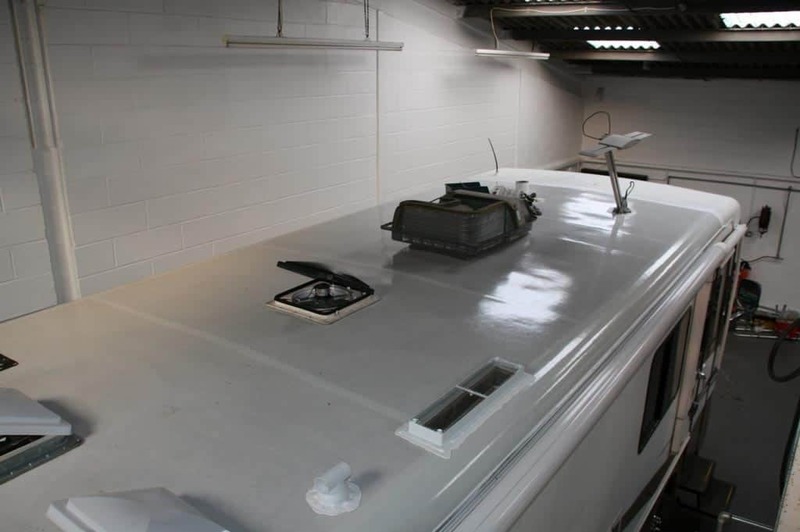 Firstly we will prepare and submit an estimate to your Insurance company. 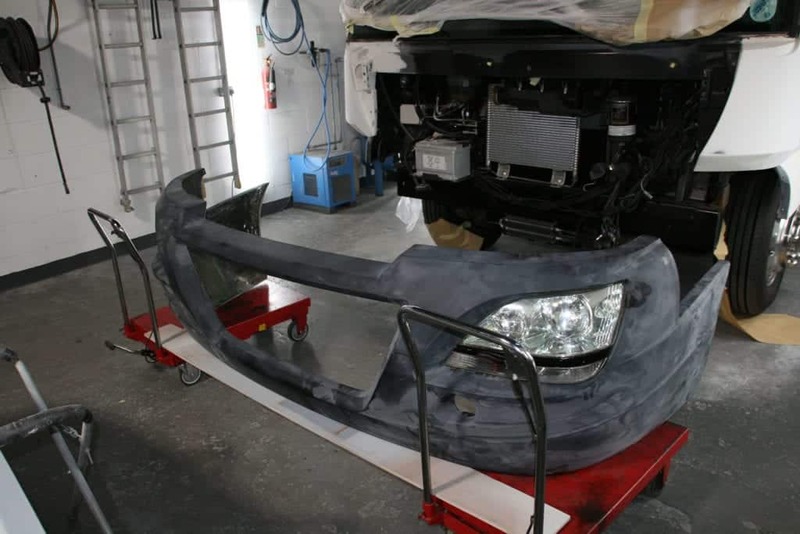 An engineer from the Insurance company will then come to our premises to inspect your vehicle, if he is satisfied with the estimate he will then give authorisation for the work to be carried out. Once the Insurance Company accept the estimate, LAS can then start to order parts that can still be obtained from America. If the majority of the parts are available, as were the parts for the Fleetwood which is pictured at the top, then a waiting game begins. 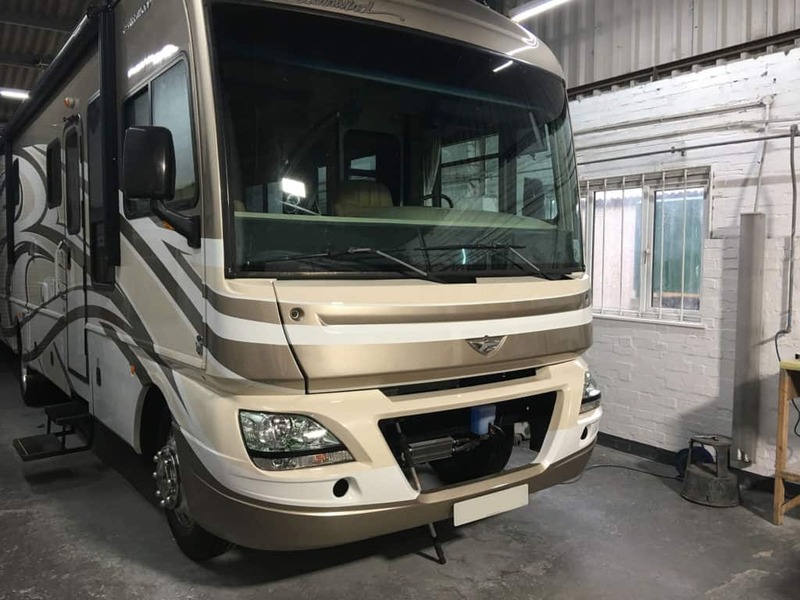 The Fleetwood Southwind that we recently repaired is still a current model which enabled us to order new parts for it, unfortunately some of these parts had to be made to order. As you can see from the images below, we did require a fair few parts. 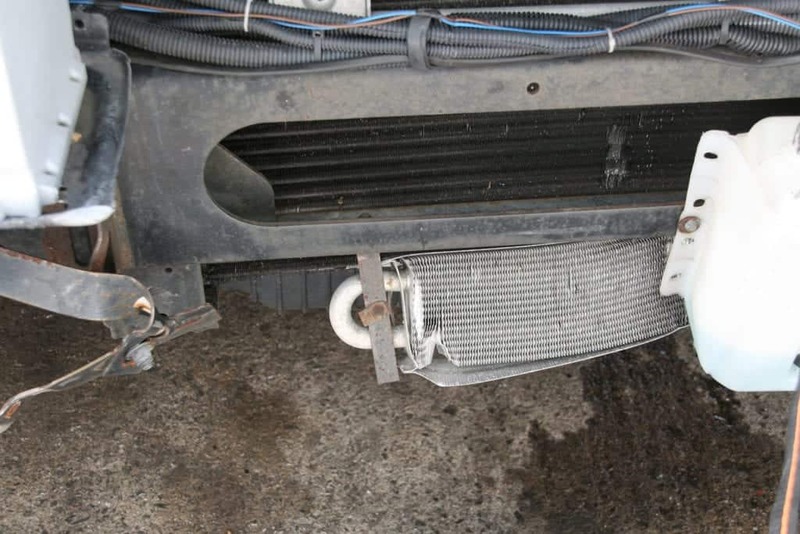 The above image shows the lower front ”x” member which has had a very heavy impact, this has pushed the “x” member into the cooling radiator behind. 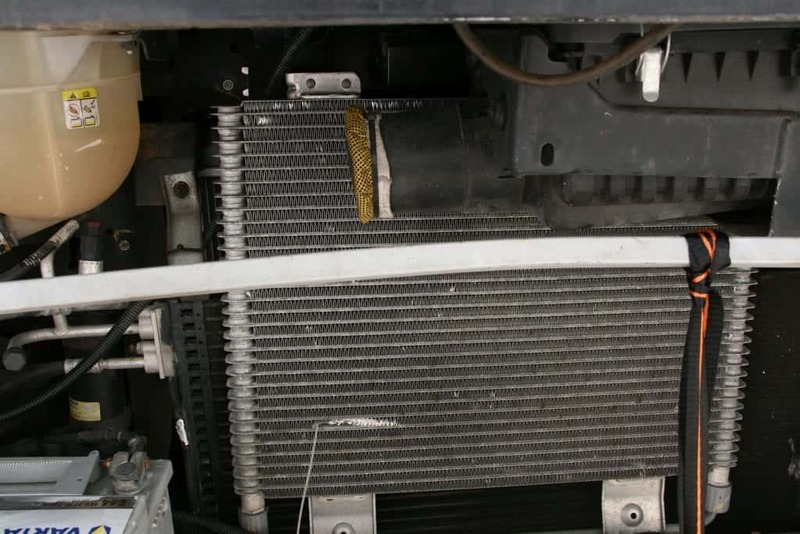 In this image you can also see the heavy impact has also broken the air conditioning condenser. In the case of the Fleetwood the lower front panel and grill would have to be especially made, this would have held up the work so we ordered these parts along with the required parts from Ford. The “x” member, radiator, oil coolers and condenser arrived relatively quickly and work began. 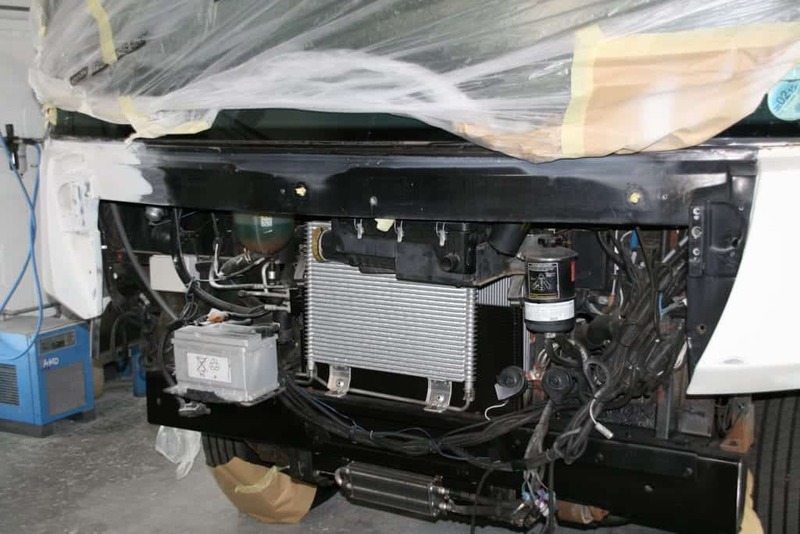 As you can see in the above image the “x” member has now been fitted along with the coolers and the radiator. The upper section of the wings has also been repaired, we cannot do anymore until we receive the top bonnet section and the lower front section. Once we have these parts we can then proceed to line the panels up making sure that everything is square. After some considerable time the bonnet and lower front panel did arrive. 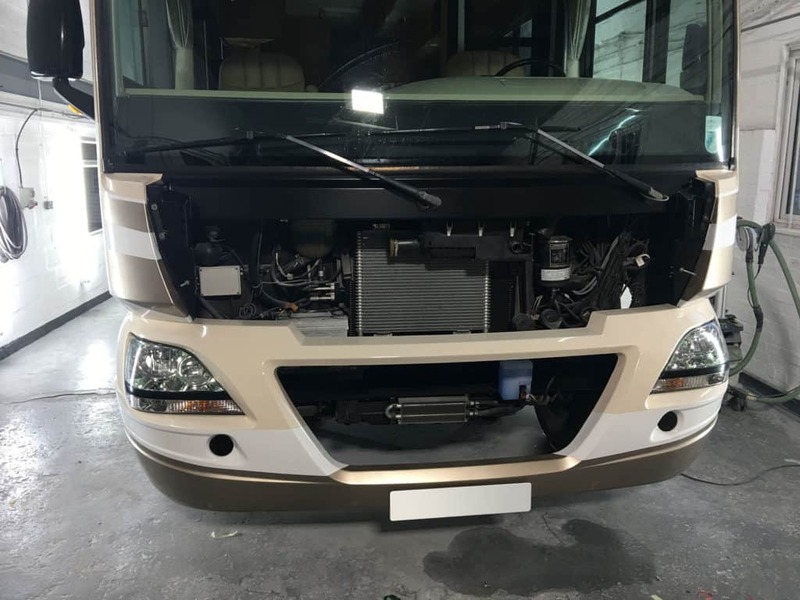 The first thing that we noticed was that all the mounting brackets and headlamp fixings had been bonded to the lower front panel in the wrong place. All the mountings had to then be removed and rebounded into the correct places, this was not what you would expect from the manufacturer (or would you)? 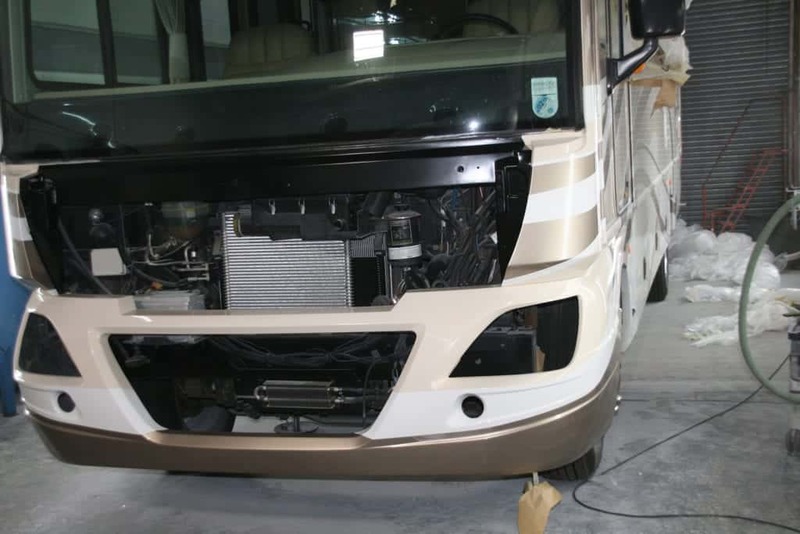 The above image shows the headlamps which now fit correctly and will later be adjusted correctly with the aid of the headlamp beam tester. As I mentioned, this was not one of the jobs you would expect to be doing. Once we were happy with the headlamp fitting, they then had to be removed so that we could flat down the panel in preparation for painting. Here the above image gives you an idea of how we had to keep offering the bottom panel up so as to make sure the mountings were in the correct place. When all of the panels fit correctly then the next phase of priming can begin. 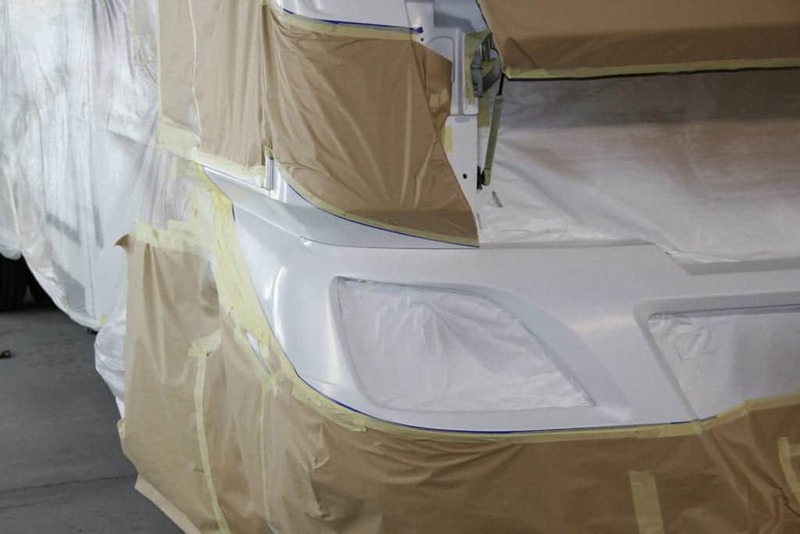 Multi coloured and striped vehicles are very time consuming to get right and require some considerable making. 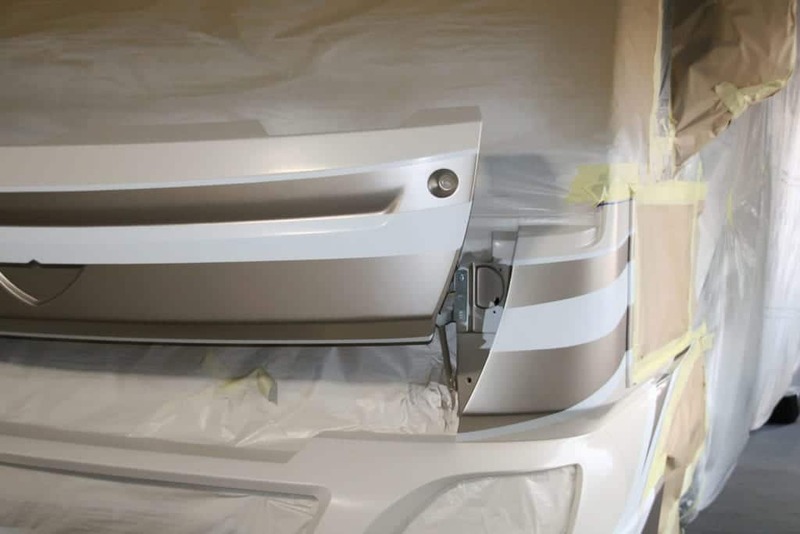 With the priming completed the next stage is to mask everything out, anything that is not going to be white, making sure all your lines are straight. 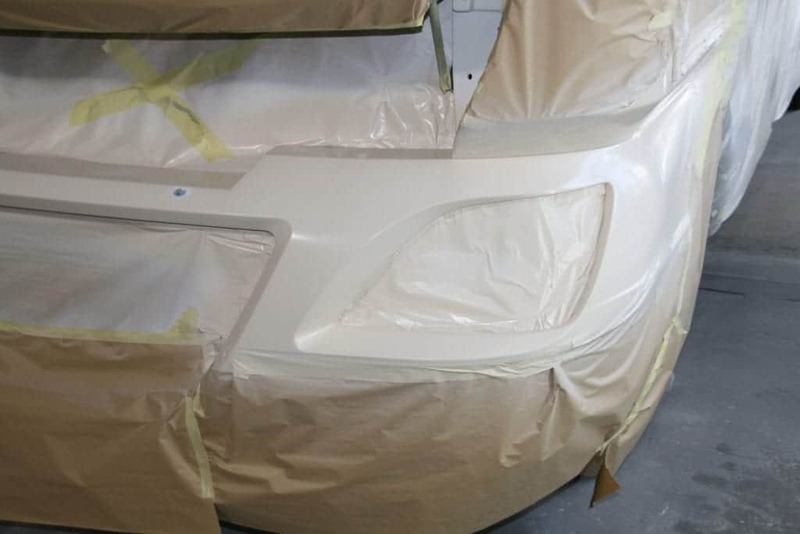 Now you can see the white base coat has been applied along with the upper bonnet panel. 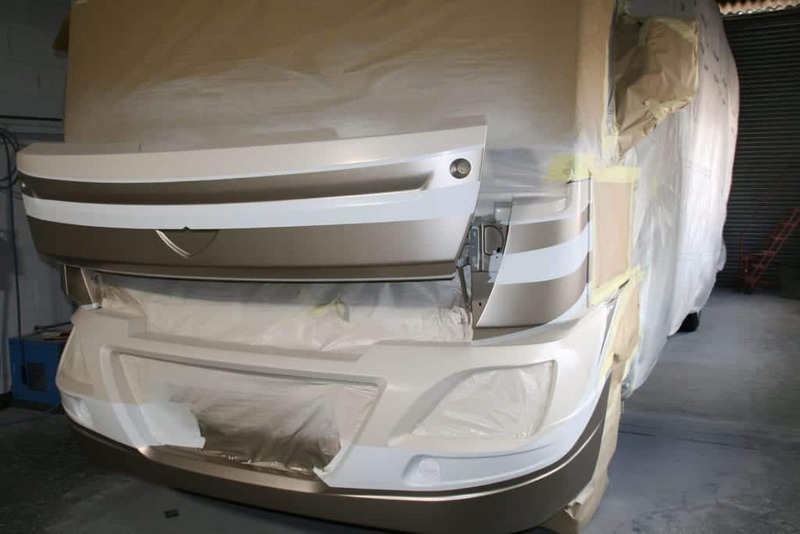 The next stage is to mask out what has to stay white, along the panels that will eventually be painted gold. This now leaves us the area uncovered to now apply the sand stone colour. 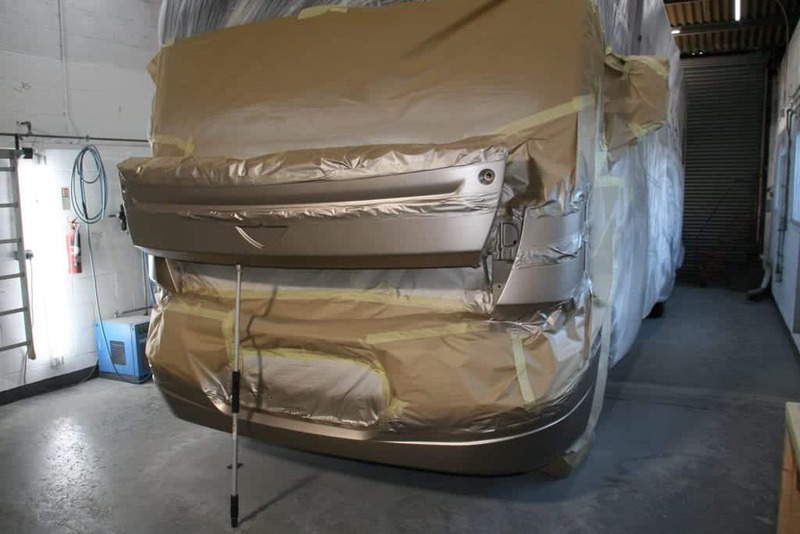 What must be remembered at this stage is that we still need to paint the vehicle in the gold and apply the coats of clear lacquer. Now with the first two colours marked out we can now apply the gold base coat paint. 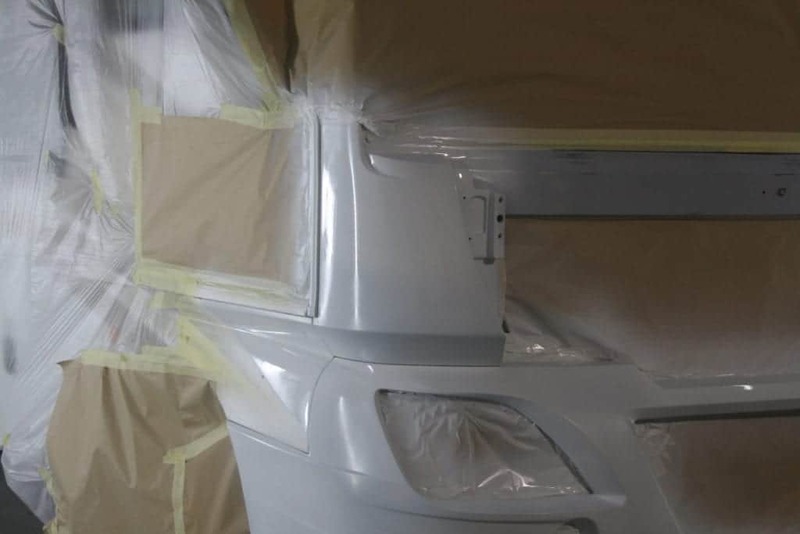 All the colours we have applied have to be left for 12 hours to allow time for the paint to cure. 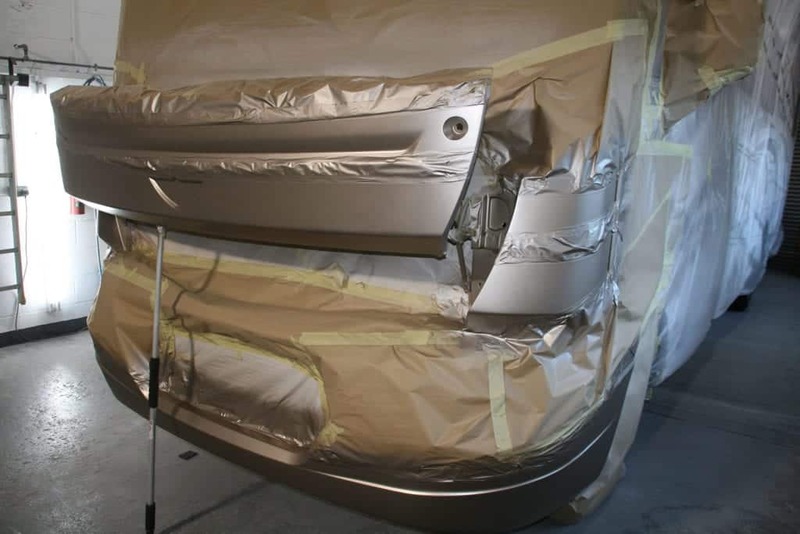 If this is not done then the lining out tape when removed for making up the next colour will remove the paint. Once the gold paint was completed and we were happy with it, we had to then leave it again for around 12 hours. 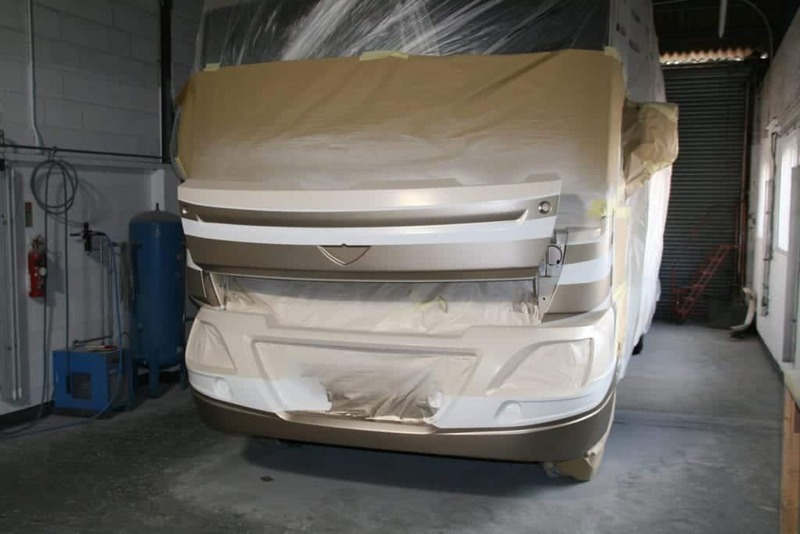 With the masking tape removed the final inspection can take place before applying the coats of colour coat lacquer. 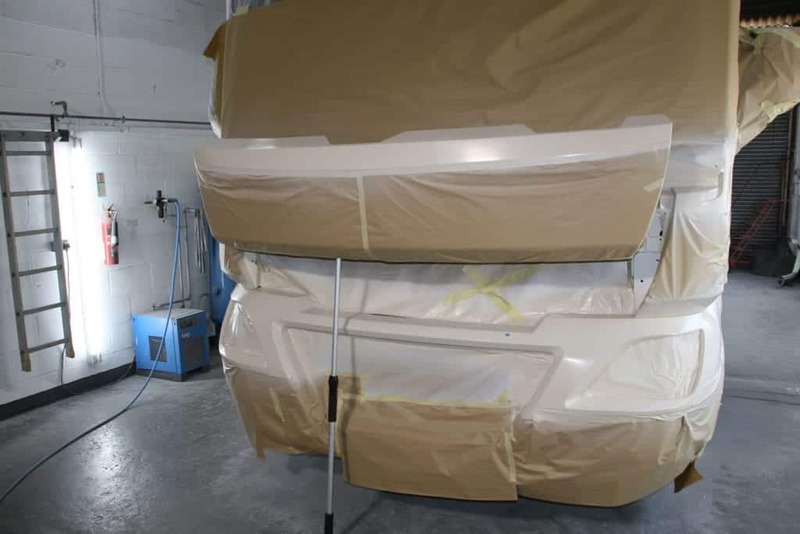 When we are happy with the work we can then remove the masking from the rest of the vehicle in preparation for the next stage, fitting the headlamps, wipers and bonnet. At this point we are near to the final completion but we are still waiting for the grill and spotlights. Pictures don’t often tell the full story, a repair of this magnitude has many problems to overcome. One thing you can be sure of is that if it is not acceptable to me then is won’t be acceptable to you, so we will do it all over again. In fact on this job that very thing did happen. A paint reaction occurred on the new lower panel and we had a paint line that wasn’t quite straight. The front was flattened back down and a coat of sealer was applied just in case another paint reaction occurred. 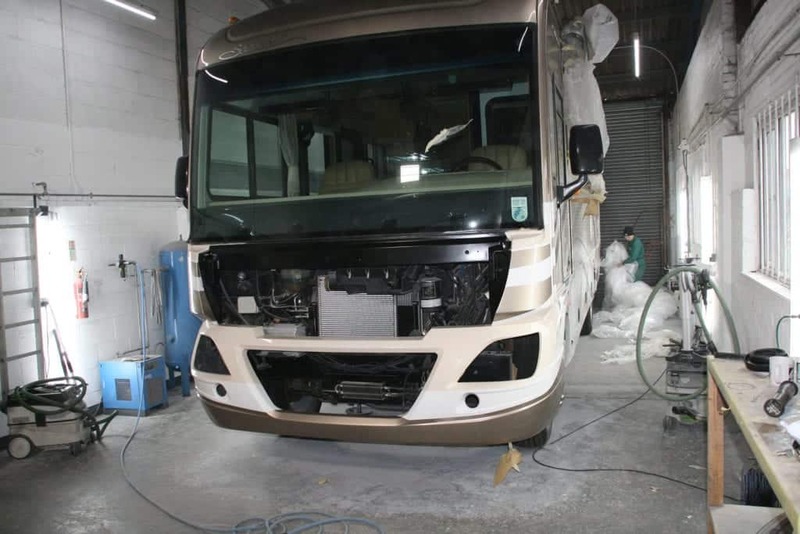 If you have been unfortunate enough to damage your American motorhome don’t hesitate to give us a call on 01604 861999.